The Ledge-Eze quick release handle from Ettore works for most channels that use brass clips. It fits well in the hand with its foam grip. This is a very good handle. I use them all the time for my business. It missed a star with me because the plastic clip tends to break too often. There is a replacement part but it breaks often enough to be a bit annoying! Ettore makes a swivel handle with the same plastic clip that, years back, was of MUCH better quality...so much more that I have NEVER had to replace those in TWENTY years! Too bad there is not better quality control. As we all know, it boils down to "made in China". Perhaps if we'd all take the time to speak up more this could change. But meanwhile I do continue to buy because otherwise this Ettore handle is a very good design and useful product. Fits clip on squeeze well and if most comfortable in ones hand. 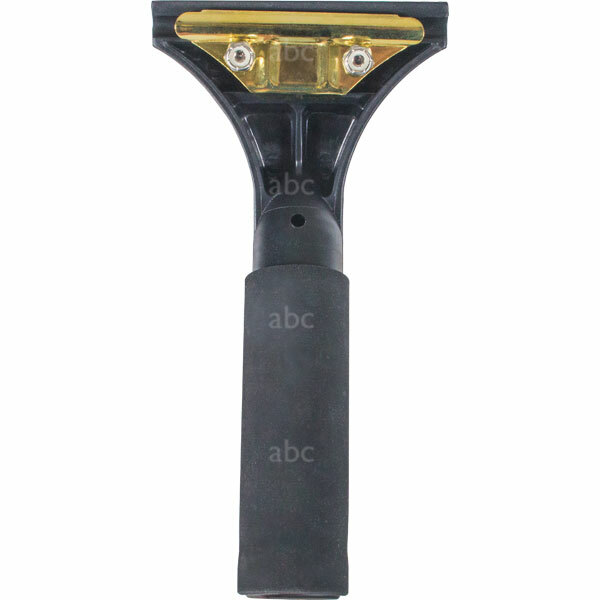 this handle is very good it is supper lite and has a very good grip to it. I love this handle. I have big hands and fits better than other handles. It is excellent for getting a clean finish on the edges or with a pole. The rubber comes unglued from the handle though. This handle would be perfect IF it also pivoted. The Contour Plus is also a great handle, but doesn't lock in the angled position. When you try to do a recessed ledge, it tries to flex. I called Ettore but there are no plans to develop one. Both are still excellent handles. I've been doing this for 40 years and love the new technology.